It takes more than simply being ‘very good’ in order to progress in today’s music scene. A band has to have something to make them stand out against the other bands vying for the same spots and opportunities. Dutch melodic act Shadowrise are a fairly new act that seem more than capable at figuring out how to keep themselves in a more unique position than their peers. 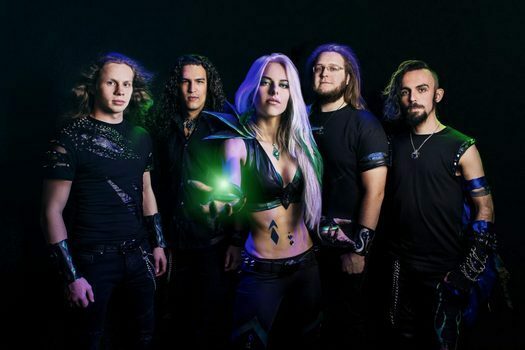 Their recently released self-titled debut takes cues from melodic death metal, symphonic metal, and power metal in order to give listeners a fresh take on some of their inspirations. The band’s use of light and darkness in their sound is particularly enjoyable – being able to wield the full melodeath power behind them or switch it up to something more melodic as necessary. We were able to speak with the whole band one afternoon on Skype, and discuss their beginnings, aspirations, and much, much more. 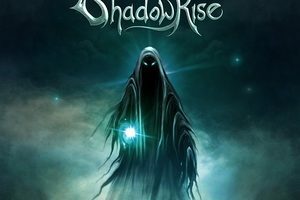 Dead Rhetoric: Where did the name Shadowrise stem from? Daniël Boomsma: We started out more as a folk metal band, doing all sorts of covers in addition to our own material. It got more melodic, less folky, and a lot of death metal influences came in along the way. Our name wasn’t really suitable, so we sat down and chose another one. We came up with a long of names, wrote them down on a list, and talked about each one. Shadowrise was chosen from that list. The main reason that we chose it was that it has a lot of open-ness to it. It doesn’t go in a set direction towards a genre. We liked that it had a lot of options for it that we could use musically. Dead Rhetoric: With a name that allows you to go where you choose, what do you feel separates you from other bands? Jack Streat: I think that there’s quite a large variety of what we are capable in terms of what we can actually perform. For example, Laura [Guldemond] and I both do clean and screaming vocals, which can get you a step away from the classic female-fronted, which is more pristine clean vocals 100% or screamed vocals. To be able to have that back and forth is really useful. Orchestrations, guitarwork, and all the melodic stuff – when I first joined, I thought there was sort of a dark side to the band, as cheesy as it sounds, but there was definitely an element of tension in the music that you don’t necessarily get with the more accessible/mainstream stuff that you would get from bands in a similar genre. There’s more lurking in the music. Laura Guldemond: I always feel that you can actually hear the playing style of Daniel; to me, he has a playing style that stands out. It’s recognizable as his own sound, which you can hear in the band. Dead Rhetoric: What are some of the ways that you have grown as a band since Escape from Shadow Island? I know two of your current members came in after that point. Daniël Boomsma: The EP was kind of like a summary of what Shadowrise had been for five years. It was our first official release, and we wanted to bring as much musical information that we possibly could, so that was our goal there. It was all generally kind of dark. It wasn’t always that way – some people thought we were also really melodic. The reaction was overwhelmingly positive. For this album we had a lot more space, with new members and input from those members, we tried to create more diversity in the album itself. It’s more open and there’s more breaks and dynamics in between. There’s also more variety in genre and directions that we are trying to explore. Dead Rhetoric: What are you particularly proud of accomplishing with Shadowrise as your first full-length album? Jack Streat: Getting everything done in time was tricky. Especially internationally – there was a lot of back and forth when I joined and was doing my vocals to get them done and getting them done the way they were intended with the little rehearsal time we had. Laura Guldemond: For me, personally, I really enjoyed being part of the whole process. For this album I was a part of the whole process and I was able to learn things. I was able to explore my voice more. If you make something and explore what you can do, you can grow as a vocalist and lyricist. Dead Rhetoric: From the whole two vocalist point, how was it decided as you were writing, who would sing each part. One of the things I like about the album is that it is not that predict feel in terms of direction. Jack Streat: Most of the cleans are Laura’s, all of the lead cleans are, and 90% of the screams come from me. So in that respect it was fairly easy to divide it up. In terms of the background vocals, that was when things got a bit more interesting. Laura and I sung a lot and I was coming into the band with most of the background vocals already written. So there was the question of if it was possible for me to sing…Laura had the same problem on a couple of lines where we went from backing Laura lines to Jack lines, because they fit my range better. So it was fairly mechanical for most of the choices – the theme of the music required more aggressive or less aggressive tones. For example, “Echoes” was all Laura to keep that tranquility. The intro to “Cradle of Death” is only male – that was one of the times we brought in some extra vocalists to beef up the power and give it as much aggression as we could get since that was what the song required. So it was partly what was possible with our respective ranges, and partly what the song was aiming for. Dead Rhetoric: Was there anything you learned in the process that you would attempt differently next time? Jack Streat: Everything [laughter]. It’s not that we aren’t happy with it, because of course we are happy with it. But it’s silly to look at where you are and say that it’s the best you are going to get. Five years down the line, we want to say, “I want to do this better, or I want to do that better.” I want it all to be better, otherwise you aren’t going to develop musically as players/musicians. Daniël Boomsma: In the writing stage, it was interesting because there was a lot of back and forth on the songs. I was used to writing a song, delivering it to who was singing, and that would be it. Then we would start rehearsing. This time we decided to incorporate a lot of things. We experimented a bit, and there were different people writing this time – it was not all me doing all of the compositions. So brings up discussions about how to improve the songs and to get on the same page on what we wanted to present about each song itself. The EP was one thought being brought in, and this album was having different thoughts being put together – it’s what makes it interesting. Dead Rhetoric: Could you discuss the fantasy elements that are in the lyrics? Where does the influence come from? Laura Guldemond: There are some personal songs and there are a lot of fantasy lyrics. “Atlantis” appeals to me – some people believe it’s there but it has never been found. We made a story around it because no one is entirely sure what is still there, or if it’s there. So it made me start thinking about the possibilities so I wrote a story about it. Perhaps it went underwater because people were very technologically advanced and they found a way to change the space/time continuum and it got messed up and it disappeared into the water. Then maybe people find it again – worse things could happen. I think those are the most far-fetched lyrics on the album. Maybe not, because “The Chosen Vessel” is about this demon entity that wants to take over everything and it found this perfect match to actually do it. Then he can grow into his full power and destroy everything. I just like stories in general, because you can make crazy stuff that can’t happen. I always like to see movies and books like that, so that’s where it comes from. I also feel it fits the music. Actually, “The Chosen Vessel” is a funny story, and maybe a little bit weird, but I was brought up in something that was almost a cult. I went to this church and some people were very into blaming demons for everything bad that would happen. That’s the background I have, so maybe it’s less fantasy for me because people had been telling me that something like that could actually happen. My parents, at some point, said I was too rebellious and told me that they were going to exorcise the demon of rebellion from me and things like that. But there are people like that, who think that those things are possible. I like the fantasy aspect because weird things appeal to me. Dead Rhetoric: Discuss the spectre that appears on the cover of both the EP and full-length? Is that something you would like people to associate with Shadowrise? Daniël Boomsma: It has kind of become a theme. It was a sketch for me at school – a guy with a cloak on walking the steps. We actually used it on a really early demo for the song “Cursed.” That was the first time the spectre came about. After that we decided to hire someone who could actually draw it properly and it got onto the EP art. We are happy with how it turned out. So we asked the same guy to design the art for the full-length as well. So that’s what the spectre evolved into. Jack Streat: You could potentially make the argument that it is also the same one from the lyric video, but I’m not sure that we are decided that it is or it isn’t. So make your own interpretation. Laura Guldemond: Do you want to know a fun fact about “Cursed?” It was actually the third song that Daniel had ever written. Dead Rhetoric: That was why you put that song as a bonus on the end? To show the band’s evolution? Daniël Boomsma: Exactly. We have played it a lot of times so we wanted a decent recording with all of the elements that we are using now, as well as having new members in the band. Dead Rhetoric: Could you talk about the theatrical element that the band brings to the stage, in addition to the music. Jack Streat: We were just talking about that actually – it was one of the subjects we discussed in a meeting we had. I think for me, personally, the way that music is changing as a medium is that people have gone from listening to an album on their own, like a vinyl LP back in the day and wanting to see a band live…it’s almost a shame, but you have to do more than just write really good music now to get anywhere. Partly because it’s so much – so many bands and music out there, and its fantastic music. But if you want to get any traction, you have to be able to stand out. Our music, because it’s very fantasy-based, we have that option to add those elements into the stage script. That’s what has inspired the costumes, the style of performance, and all the theatrical elements. We try to link them to the songs as much as we can, but there’s only so much you can do without having Iron Maiden’s Eddie come on stage in certain songs. People come to a live show to see a spectacle, not just hear the music. The live sound has gotten so good that people can effectively get the album performed to their ears, so you want to go above that. You want to go as far over-the-top as you can – if any genre is going to be over-the-top, its metal. Dead Rhetoric: Going along with that, what’s the most important aspects for a newer band to focus on in today’s metal scene? Laura Guldemond: I think the show must be spot on – you need to involve the audience and recreate it as well on the album, or better. Everything has to be spot on. People see that you record something and [can] deliver it live. Daniël Boomsma: I think music-wise, there’s a lot of things that the music scene can improve on. A lot of bands sound alike and everything seems to be been explored already. The true magic lies when you can combine things and present them in a way that you can get a message or story across in the music. That’s my personal goal for writing music – to get a story going, and have it be told by the music itself. That doesn’t have to do with genres or heavy riffs or technical techniques – it’s in the music itself. If it can be told with three chords, I’ll use three chords. If it needs crazy shredding, then I’ll do that. Jack Streat: The storytelling fits well with the lyrics. I think “Atlantis” and “Evil Conductor” are both examples of that. The music fits the lyrics very well. You can feel a lot of lyrics today as being slapped on top of a soundtrack. If we are writing a story with the lyrics, then we are writing it with the music. It wouldn’t make sense to do two different stories, so you really have to get that fusion of the two to make it feel complete. Appie Kalaç: I haven’t played a lot of live shows yet with Shadowrise, but what I would see as a live goal is to awaken an emotional response. That’s the power of the female metal that we do. We have this kind of virtuosity and power as well as the emotional aspect to the music. Dead Rhetoric: So where would you like to see Shadowrise go in the future, musically? Jack Streat: That was another thing we have been discussing, as we begin to write the next album – which has already begun, but only just begun. We are still working it out. We will partly have a much better idea of it once the album is out and how it does, and what people like. What’s interesting to me is that you have songs that work very well live and songs that work very well on a record. Then there are a few songs that do both. Obviously, the aim is to get that. Keeping that diversity is worth having. If you release an album of songs that make you go, “What?” When you listen to it on headphones, and you tour with it and don’t get the same response, that’s not going to be as motivating as having the visceral response from the crowd. We want the darkness to stay, musically, although we have adjusted it in various songs. Appie Kalaç: It’s going to be very surprising for us for what happens to us – Jack joined during the process, I joined after the album was recorded, and we both have some perspective on what music Shadowrise could make. The next album will be quite different I think. Jack Streat: Potentially now there are three main songwriters, which should help us with diversity. Laura Guldemond: I think we also want to try to switch out more vocals. Jack will be doing more cleans, and I will be doing more grunts, and I think that’s a nice experiment to do at least for some songs. We will see how that works out. Also, what I think is that we definitely want a few songs that people can do a wall of death on live. We need that. Apart from that, it will be somewhat like we have done, but we are going to really talk about what works well. Dead Rhetoric: In doing some research on the band, I saw that Laura was on something called Idols. Is that like American Idol? Laura Guldemond: Yes, it’s like the Dutch version. I participated in that, and it was a fun experience. I went to Bali with them – the Indonesian Islands, because they had to shoot some things there too. People still say they saw me on it, which surprises me that it still happens. I don’t think it was a really big deal, but it was a TV show so people saw it. A lot of metalheads told me that the only reason that they watched it was because I was on it, which is kind of funny. Dead Rhetoric: What is next for Shadowrise? Jack Streat: The works – we want to reach as many people as we can. It’s going to be a bit logistically interesting as I don’t live in the Netherlands. Laura Guldemond: We really want to do a European tour this year. Daniël Boomsma: We have a release show coming up, and it will be the first time that we play the album and [the current band members] will be playing live, so that’s a nice start. We will see what happens from there. We have one show in Germany coming up as well. Jack Streat: We have a few more lined up too, but we can’t talk about them yet. Appie Kalaç: Most of what we have confirmed for 2018 will be venue gigs, then in 2019 that’s’ when we’d like to join some festivals.